The half-birthday half-cake definitely does not get the planning and consideration of their real birthday cakes. 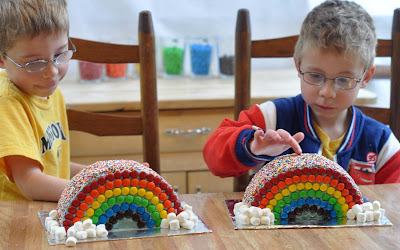 I need something that looks good on a half cake, and that doesn't take too much time, because this isn't a "real" celebration. It's just fun. 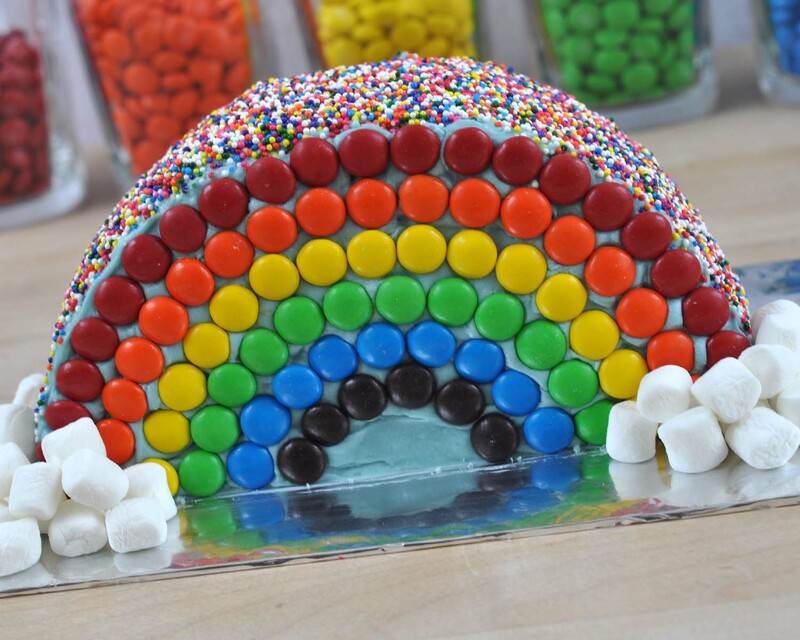 This rainbow cake seriously took me less than 3 hours total, including baking, making icing, decorating, etc. 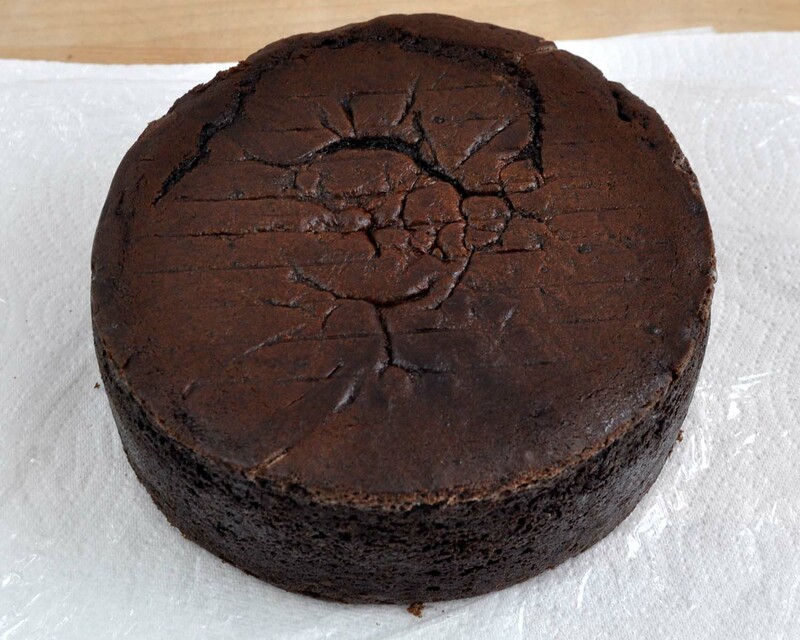 I baked it in an 8"x3" round pan, one of my favorites. This way, when I cut it in half, I wouldn't have to worry about having layers to hold together when covering the sides with sprinkles. If you don't have an 8"x3" pan, you can absolutely use an 8" or 9" round pan that is thinner. You can then just glue the two halves together with icing when you cut it in half. And you could then use the rest of the cake batter to make cupcakes or something. 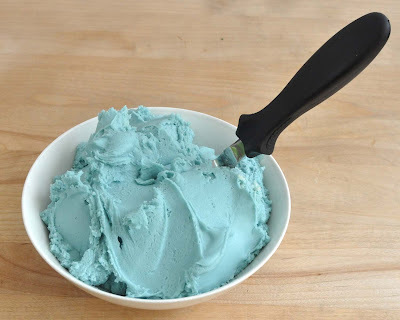 I made Cream Cheese Icing, and colored it light blue with a few drops of food coloring. I figured blue sky behind the rainbow made the most sense, right? 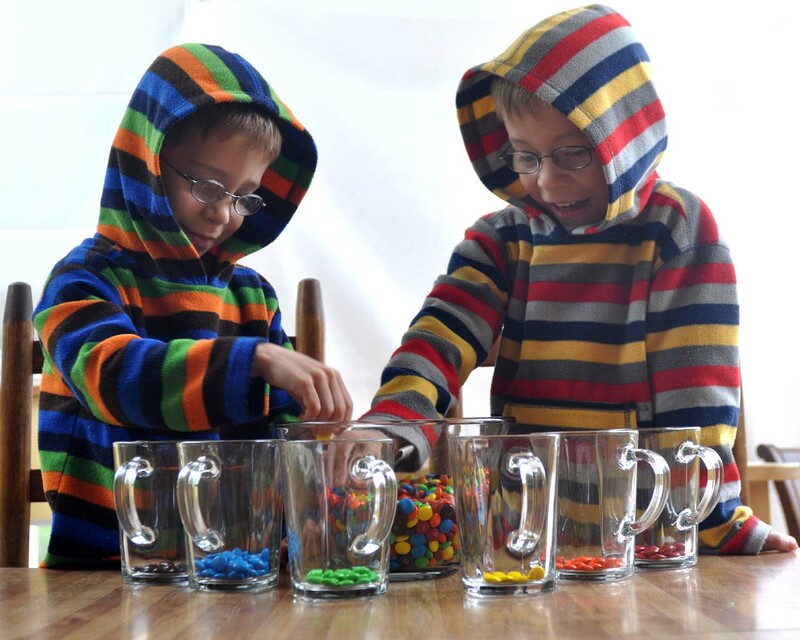 Isn't it funny to see that all M&M colors are not made equally. Apparently the M&M people prefer blue. 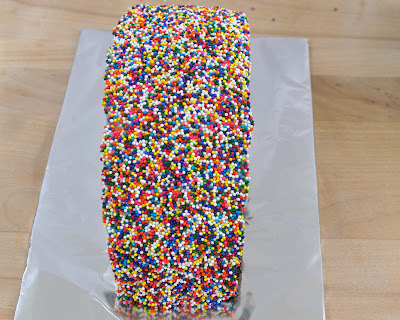 I was nervous to coat the side/top of the cake with the sprinkles because I've never done this before. It wasn't as bad as I feared. The nice thing is that you really don't have to worry too much about crumbs because they'll be covered with sprinkles anyway. But, you do want to try to make it relatively smooth. 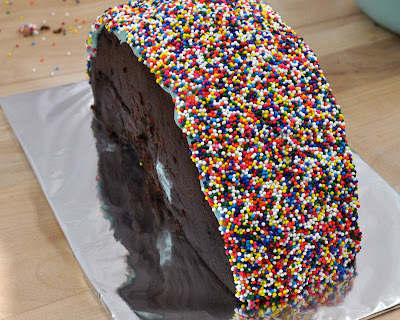 You can see if there are weird spots of thicker icing when you cover it. I did this on a paper towel because I didn't want to get the serving plate dirty, since I would be moving the cake and setting it back down. I was afraid I'd never get it back in just the same spot. 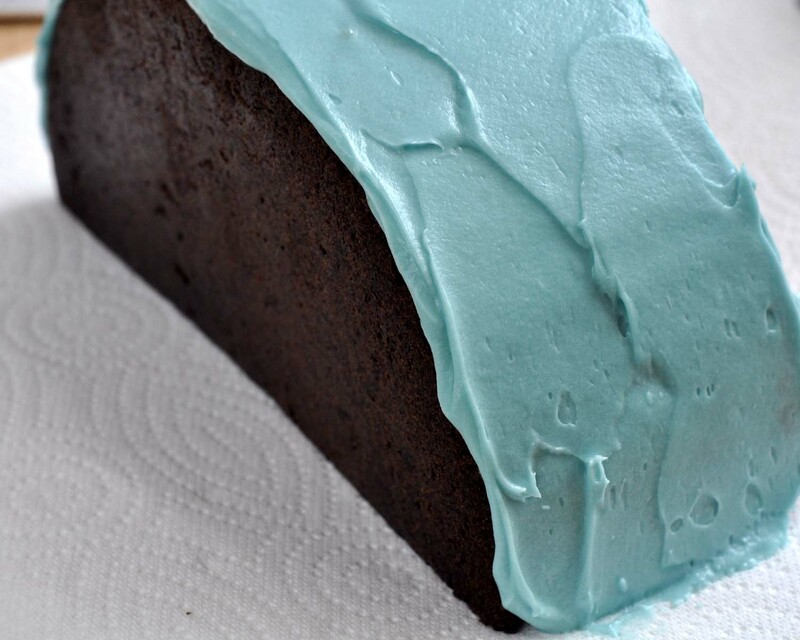 Don't put too much icing on the side. 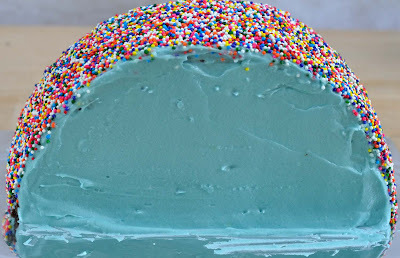 I learned that when you roll it in the sprinkles, it smooshes the icing and spreads out a little. You don't want it to get too spread out, or it makes covering the sides harder. Once you get the sides covered, you are ready to roll (literally). 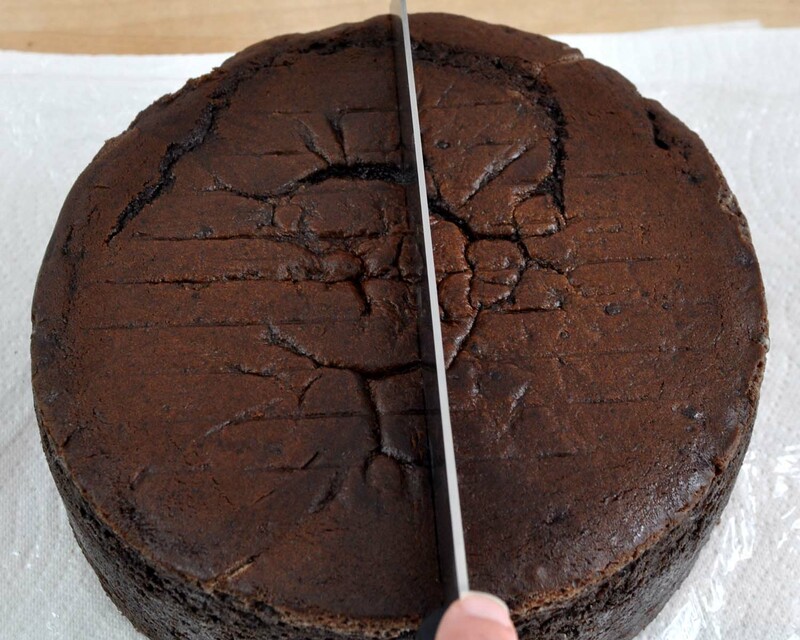 Hold the cake gently by placing a hand on either side. 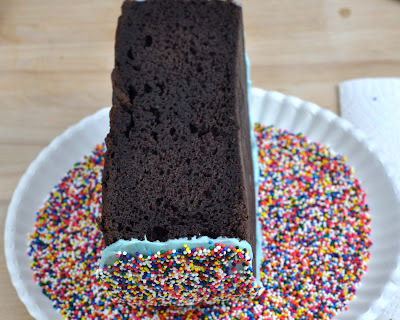 Pick it up and place it onto the sprinkles. 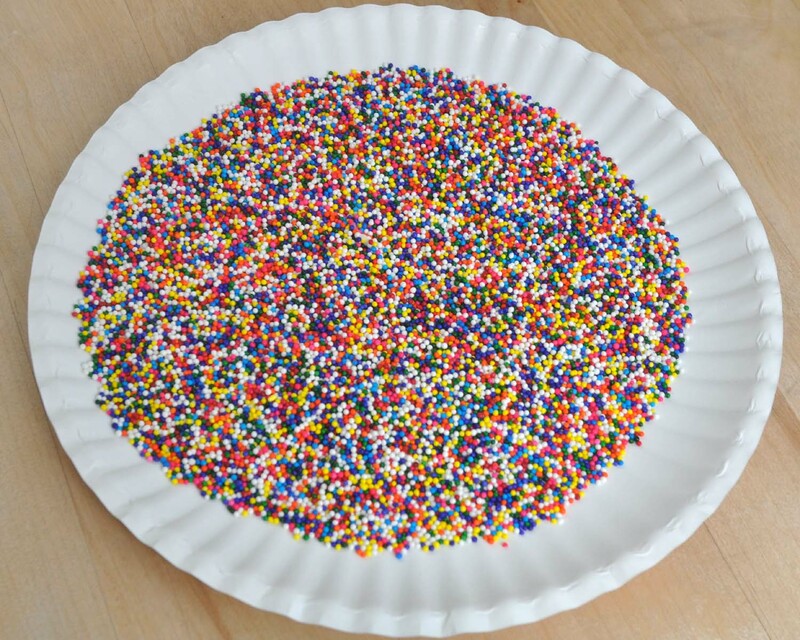 I did have a few times when the sprinkles got a little too thin on the plate, so the icing stuck to the plate (eek!). 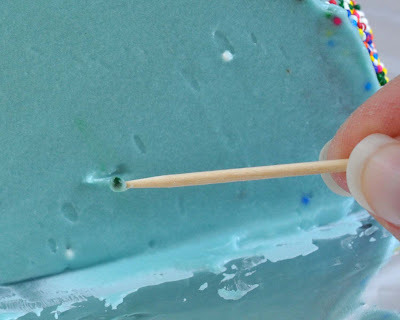 Be careful that you have a thick layer of sprinkles, and that you can shake the plate to get them back into a thick layer before you move it. Admittedly, the second cake I rolled went much better than the first. I think if/when I do this again, I'll be able to do it even better. I did have a little issue with the top of the cake (what would normally be the top of the cake) sticking to my fingers, but it wasn't too bad. 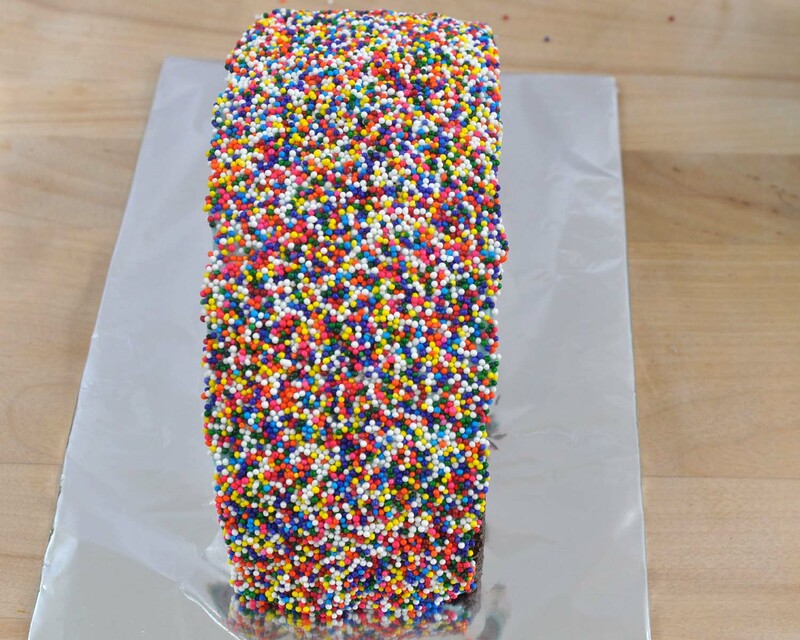 To ice the sides, you need to be a little careful about not getting the other sprinkles mixed in. Some mixing will happen. You just want to minimize it. So, just be really slow and deliberate about your spatula. 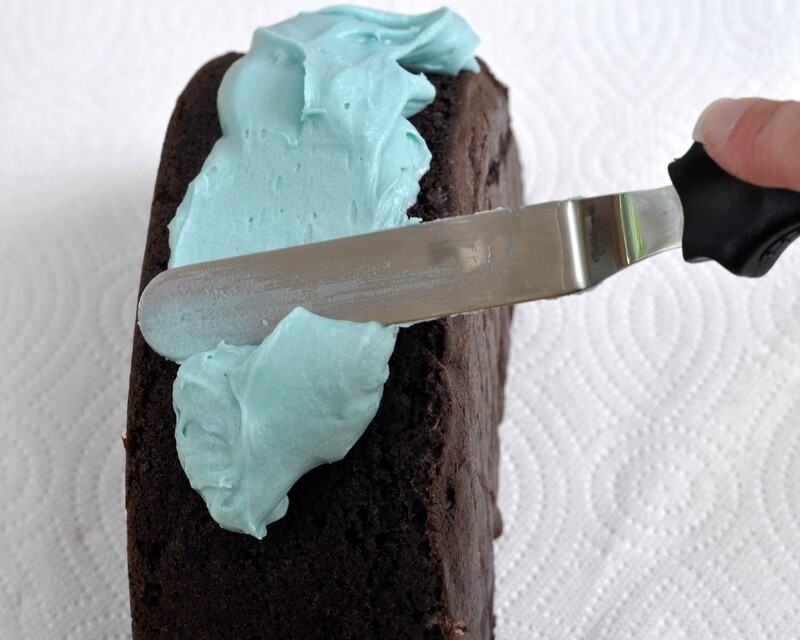 Keep it away from the "seam" where the icing will meet as much as possible. And move towards the "seam" rather than away from it whenever you can. 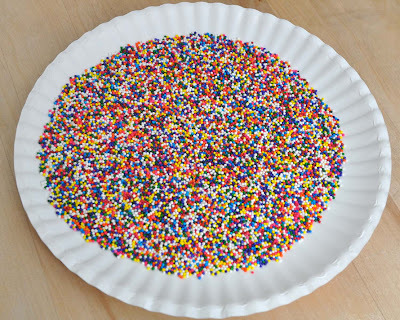 For the most part, who cares if the sprinkles mix in, because it's going to be covered with the M&Ms anyway. 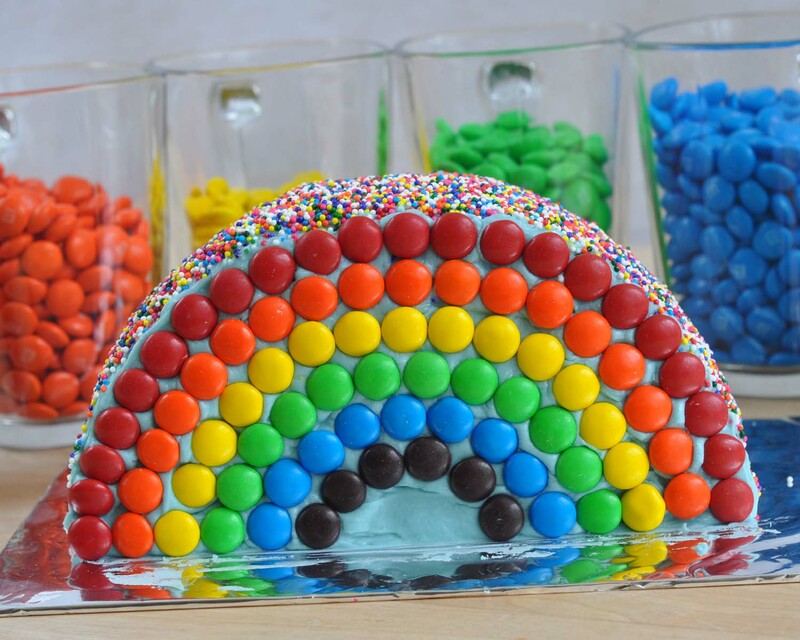 To make the rainbow, simply place the M&Ms ("m" side in) on the cake. 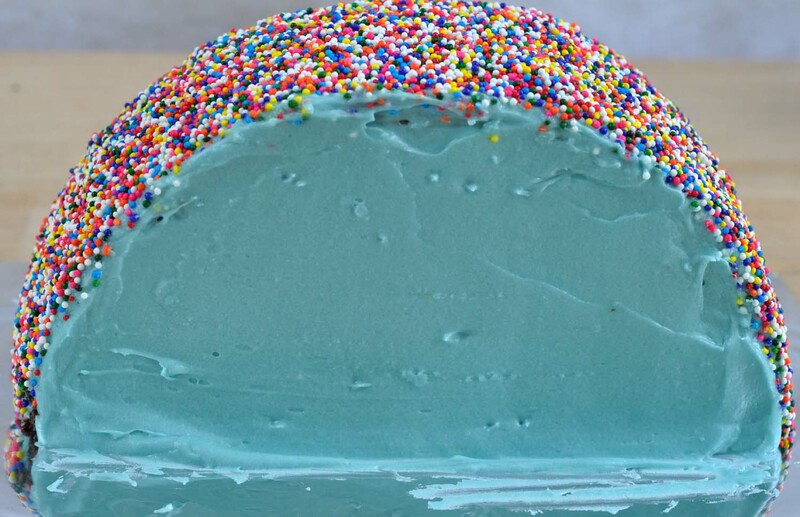 If you're using an icing like my Decorator's Buttercream that develops a crust, be careful that you don't wait too long to add the M&Ms, or it may be harder to get them to stick. You have to get a little creative in a few spots when you get towards the bottom because they don't all line up perfectly, but once you add your marshmallow "clouds," you're good to go! For the marshmallows, I just placed them on there. The cakes weren't going anywhere. 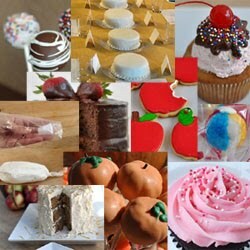 But if I needed to transport the cake, I would have used a little icing to glue them together and to the cake board. The boys, and their friends, loved the cake. 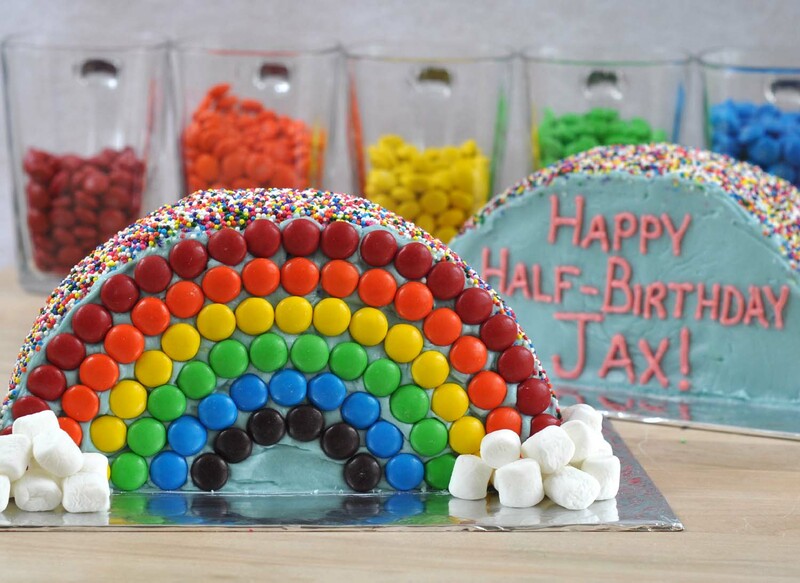 I mean, what's better than cake, covered with candy, sprinkles and marshmallows??? 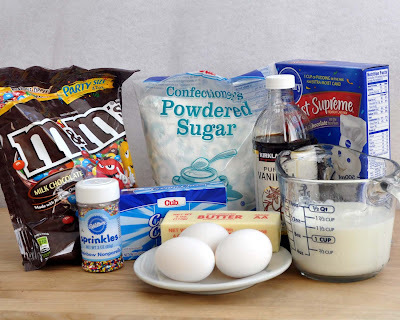 *Note: The M&Ms lose their "crack" when you refrigerate the cake in an airtight container. So if you like that hard candy coating, don't make this too far in advance. I love this post! Today is my half birthday, and you'd better believe I still celebrate it. I'm very excited to make this for one of my nieces at the end of the month. I plan on baking it like you did, in a 3" deep 8 round. 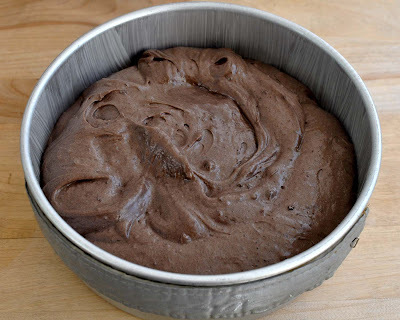 How long did you end up baking it for? Thanks! Courtney, The 8x3 pan usually takes 55 minutes to an hour in my oven. I would not check it any earlier than 45 minutes, because it does fall easily if you check it too early. Would love to make this for my son's 7th birthday. Can you please guide me to source m&m's in indigo & violet colour. Thanks! I used the brown ones as my purple. I think they worked out fine. But you could always check their website. I know that they do personalized ones, so I bet they have purple ones you could order, too. What size of m&m did you use? Regular or bigger with peanuts? Such a great idea!! I'm going to make this for my niece's half-birthday and her name means never-ending rainbow in our native tongue. It seems so fitting :) thanks for sharing! The cake should get you 10-12 servings, depending on how big you cut it.